You fight through Southern Florida traffic just to get to the airport. Then come the long lines to check in your bags and pass through security. Finally, it’s a mad dash to the gate. Your flight boards in 10 minutes and you’re three terminals away. You dodge slow-moving, sleepy-eyed travelers as you sprint to catch your flight. You arrive, only to find out it’s been delayed because of heavy fog. And then you wait – again. The holiday travel season can be maddening. But don’t let the big crowds, expensive tickets, and frustrating weather delays ruin your holiday fun. Delray Station offers these five tips to take the stress out of holiday travel. Plan ahead. Finalize your travel dates as early as possible and start shopping for those flights. Deals are out there if you know where to look, you just need to give yourself enough time to find them. 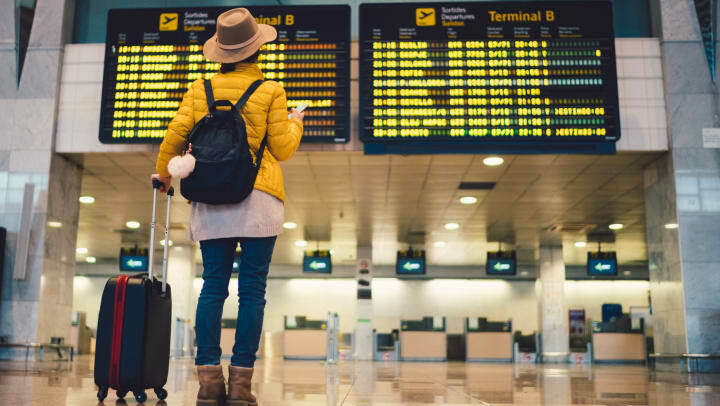 Hopper, Momondo, Skyscanner, and Google Flights are a few of the feature-rich flight search engines out there that can help you score a deal. Fares often go up as the holidays near, so start looking early. A little planning goes a long way. Spare yourself unnecessary stress by planning your route to the airport in advance and familiarizing yourself with the airport’s onsite and offsite parking options. If you’re booking a shuttle, be sure you book in your spot well in advance. Leave early. Whether you’re driving or flying, consider packing snacks – and perhaps even full meals – to save time and money. And don’t forget that cellphone charger and headphones! Don’t lug bulky holiday gifts through the airport. Box them up and ship them to your destination instead. Airlines charge to check luggage anyway. Spend that money on shipping instead and save yourself the hassle. Or, if shopping online, ship those gifts right to your destination. Real Simple Magazine offers these tips for shipping gifts of all shapes and sizes. Road tripping it? Before hitting the open road, research the best routes to avoid traffic. Look into where you might want to stop or stay along the way. Download handy travel apps ahead of time. Waze is a wildly popular navigation app with real-time traffic information provided by other drivers. Old standbys like Google Maps and Apple Maps are also good options. GasBuddy will help you find great gas deals, while Roadtrippers will guide you to hotels, restaurants, and attractions along the way. Check out this Outside Magazine list for even more handy road-trip apps. … to have fun! The holidays come only once a year!